Many Rooms only works because of the generous and creative support of our partners and volunteers – we are very thankful for them caring enough to make a real difference in the lives of those who need it most in our community. We presently involve over 150 volunteers. We also seek to involve around 5 participants in volunteering. 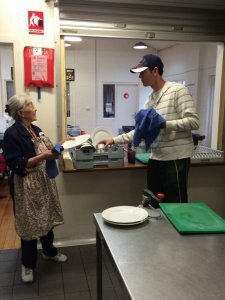 Our kitchen services provide a practical way volunteers can serve people doing it tough but also participate in a mutually supportive community. We encourage our volunteers to serve once a month for at least one year. Our Community development team attend the kitchen twice a month. They have lunch with the participants, building relationship and help to provide the continuity of a familiar face and a listening ear. This team are also responsible for providing activities for participants. If you would like to use your business experience and talents to help on the Many Rooms National Committee, we’d love to hear from you!